Tired of overhearing people exclaim it’s “dry and drab and tastes like cardboard,” while dutifully plopping a box into their shopping cart, Matzo was ready for a change. Knowing simplicity is its biggest attribute as well as its biggest flaw, Matzo asked for some assistance from its friends the next aisle over. “I’m in desperate need of a quick makeover,” Matzo cried. Cauliflower completely ignored Matzo, while canned chickpeas nodded, but insisted they were too busy toiling away with tahini to help. 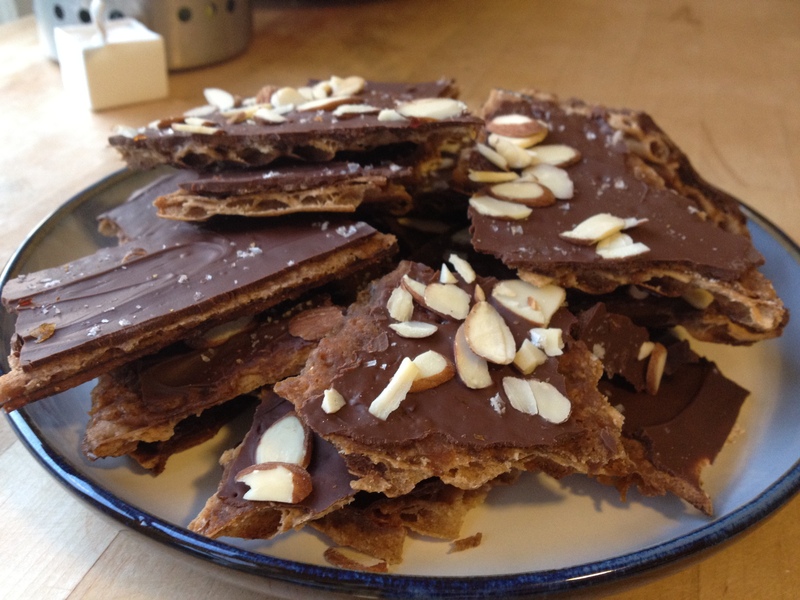 Fortunately, butter and brown sugar were feeling generous and jumped at the chance to come to Matzo’s aid, promising a toffee coat with a snappy lining that would dazzle. 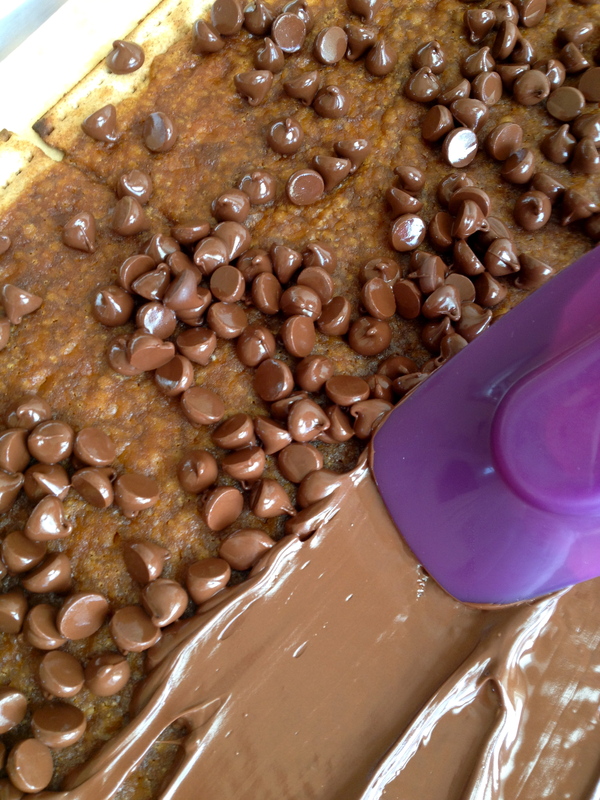 Semi-sweet chocolate chips, eager to elevate Matzo to the next level, insisted on contributing their glossy, cocoa sheen. Oh Matzo, you delectable diva, you. I can’t stop eating you. Preheat the oven to 375 degrees. Line a rimmed baking sheet completely with foil, making sure the foil goes up and over the edges. Cover the foil with a sheet of parchment paper. 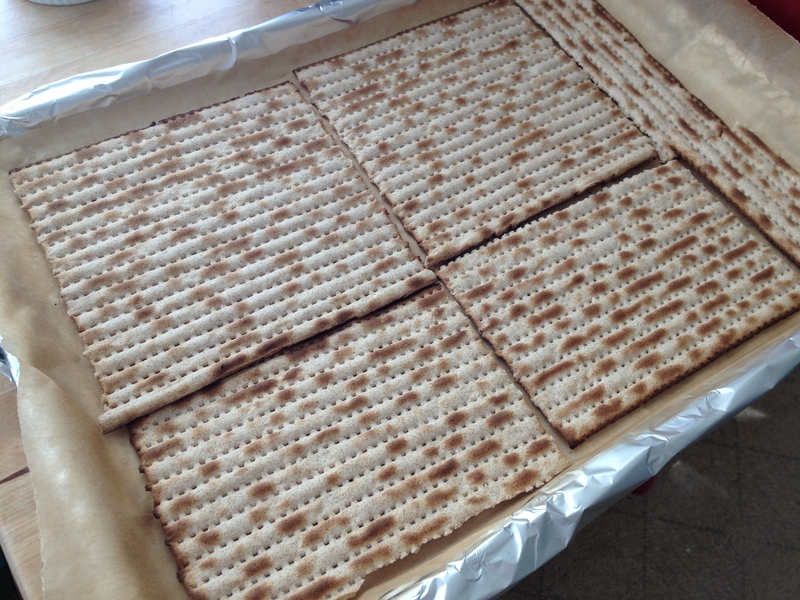 Line the bottom of the sheet with matzo, breaking extra pieces as necessary to fill in any spaces. In a 3-4 quart heavy duty saucepan, melt the butter and brown sugar together, and cook over medium heat, stirring, until the butter is melted and the mixture is beginning to boil. 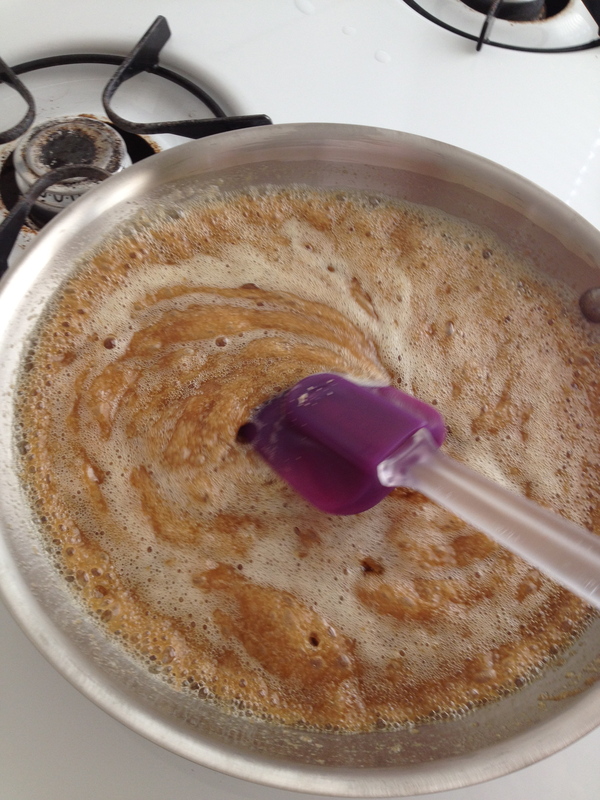 Boil for 3 minutes, stirring constantly. Remove from heat, add the salt and vanilla, and pour over matzo, spreading with a heatproof spatula. Put the pan in the oven and reduce the heat to 350 degrees. Bake for 15 minutes. As it bakes, it will bubble up but make sure it’s not burning every once in a while. If it is in spots, remove from oven and reduce the heat to 325, then replace the pan. Sprinkle with toasted almonds, flaky sea salt, or roasted cocoa nibs. Fast-forward 8 months and sprinkle with crushed candy canes for a holiday treat. Let cool completely, the break into pieces and store in an airtight container until ready to serve. It should keep well for a couple of weeks in the fridge and much longer in the freezer. Note: If making for Passover, omit the vanilla extract or find a kosher brand.